The worst thing about taking your pup for a walk in the winter is getting home and they’re all damp and covered in mud. But one company has created a special dryer for your dog – and we can’t believe nobody thought of it before. The Puff-N-Fluff is a huge coat that fastens with Velcro and features an attachment for your hair dryer. The warm air gets trapped within the coat, drying more than one area of your dog at a time. It comes in four sizes: an extra small, which costs £26.62, a small, priced at £30.42, a medium for £34.23 and a large for £49.46. According to the company, it’s more time effective than using a hair dryer alone. 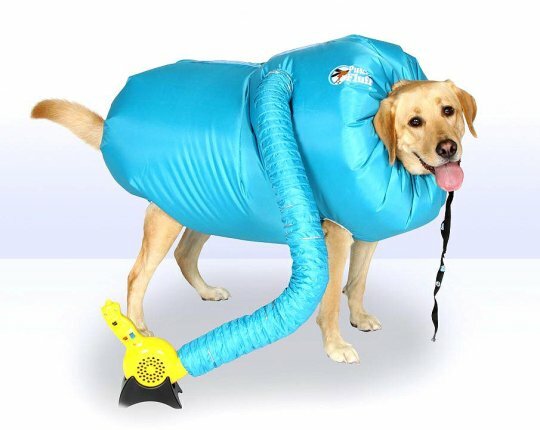 The coat aims to relieve the anxiety associated with using hair dryers on animals – and apparently also reduces the ‘wet dog’ smell. It features four elasticated holes for your dog’s legs, and the sides are fixed with Velcro to be fastened. The company says ‘virtually any blow dryer’ can be attached, with the length of the drying process depending on the size of your dog and the thickness of its fur. However, you do have to be careful with the coat – as your hair dryer needs to be on a low temperature. Never use it on a high heat, as the coat is constructed so that the air can flow out through the neck, tail and legs. The description adds: ‘Please monitor your dog for any signs of overheating such as heavy panting or tongue hanging out of the mouth. 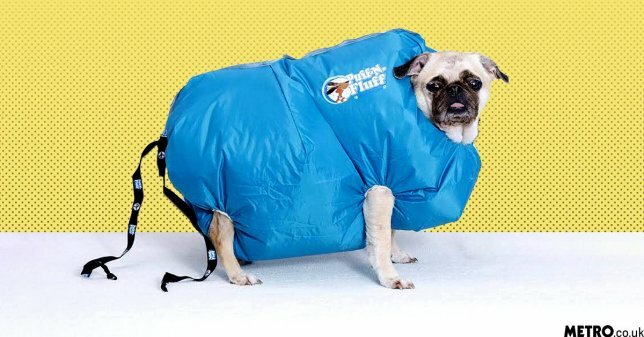 ‘Remove the Puff-N-Fluff if you see any signs of overheating.’ So far, the coat has had amazing reviews – with one person calling it the ‘best invention ever’. Someone else says their Yorkie absolutely loves it.